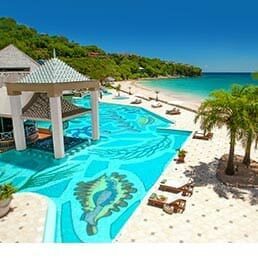 Saint Lucia’s most glamorous resort, Sandals Regency La Toc is a magnificent 220-acre estate set on a half-mile, crescent-shaped beach, cradling exotic coral bluffs, lush hillsides and rolling fairways. Featuring a challenging executive-style golf course, stunning oceanfront suites and the private enclave of the Sunset Bluff Village, this resort is recognized as the most sparkling jewel in the islands. Indulge in Five-Star Diamond French cuisine and other international cuisines with access to 27 restaurants with the Stay at 1, Play at 3 exchange program. Recognized as the most sparkling jewel in the islands, the "Emerald of the Caribbean" glitters invitingly along the half-mile crescent shaped beach, cradling exotic coral bluffs, lush hillsides, and rolling fairways. If you're looking to be immersed in a glamorous, exotic setting in a sprawling 220-acre estate with its own golf course, you'll love Sandals Regency La Toc. From stunning oceanfront suites to the private enclave of the Sunset Bluff Village, Sandals Regency La Toc features the most innovative and luxurious rooms and suites. The Sunset Bluff Village is home to two-story villas with magnificent ocean views, butler service and many feature their own private pool. Carved into the edge of a dramatic bluff directly over the sea, Sunset Oceanview Bluff is actually a resort-within-a-resort. The spectacular Sunset Oceanview Bluff Suites feature magnificent views so breathtaking they seem to flow into infinity. Some are two-story villas, many with their own private pools, while all include exclusive butler service. Combining indoor refinement and outdoor glamour, these suites are the epitome of Sandals luxury. Set at the resort's summit, each boasts the island's best ocean views - uninterrupted for 180 degrees. Bedroom and living room both lead to a sundeck with your own zero-entry plunge pool with a waterfall and whirlpool. With our exclusive Stay at One, Play at Three Exchange Privileges, you can expand your options to dine and play at two additional resorts. Complimentary round-trip transfers between all resorts are part of the Sandals Luxury Included® difference. With nine tantalizing restaurants awaiting your pleasure, you'll find deciding on dinner your most difficult task of the day. Romantic ambience, impeccable service, and scintillating international cuisine make every dining experience a vacation in itself. Our exclusive partnership with Robert Mondavi Twin Oaks® wines raises the standard of the included wines poured at our all-inclusive luxury resorts. We also provide an amazing selection of wines for sale on our Manager’s list. Unlimited premium spirits are included 24/7 and served everywhere throughout the resort. We have designed the bars exactly where they should be—right on the beach and directly over the ocean—to give you a truly authentic island experience. We've even created bars inside our beachfront pools. Guests staying at Sandals Regency La Toc can enjoy the 9-hole Sandals Regency La Toc Golf Club on premises, or take a free transfer to the nearby 18-hole Sandals St. Lucia Golf & Country Club at Cap Estate. Both courses inspire performances at all levels, and complimentary green fees invite repeat plays at leisure. Stake out your ideal space by the largest pool in Saint Lucia and spend the entire day in worship of the sun. 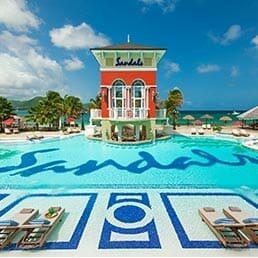 Sandals Regency La Toc features three freshwater pools at The Pavilion, Le Piton, and The Sunset Bluff – two of which feature swim-up bars. At Sandals, all gratuities are included. From bellhops to waiters to bartenders, all tips are taken care of. In fact, only personal butlers are allowed to receive tips. Enjoy Sandals Resorts industry–leading hospitality and personalized service, and leave your wallet at home. The best way to experience Saint Lucia in full is to get up close and personal with it. Island Routes excursions are led by people born and bred on the island, and they can't wait to share all the best spots and most exciting adventures with you! From stunning oceanfront suites to the private enclave of the Sunset Bluff Village, Sandals Regency La Toc features the most innovative and luxurious rooms and suites. With 9 unique restaurants showcasing the cuisines and ambiance of Italy, France, England, the Caribbean, and the Far East, you'll find deciding on dinner your most difficult task of the day. Each restaurant has a team of dedicated international chefs whose attention to detail and service is what you'd come to expect in the most acclaimed restaurants across the globe. Choose from up to 27 Restaurants & More! 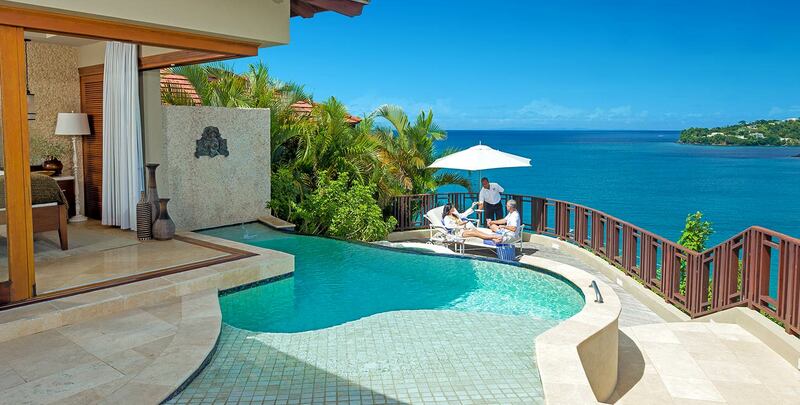 In Saint Lucia, you get a mega-vacation that includes three resorts for the price of one. Experience all the restaurants, all the beaches and every amenity. Plus, round-trip transportation is included between resorts. Masters of the game and beginners as well will thrill to the lush landscape of our two challenging golf courses on the island–Sandals Regency La Toc Golf Club and Sandals St. Lucia Golf & Country Club at Cap Estate. Free green fees and complimentary transfers invite repeat plays at leisure for all Sandals guests in St. Lucia. 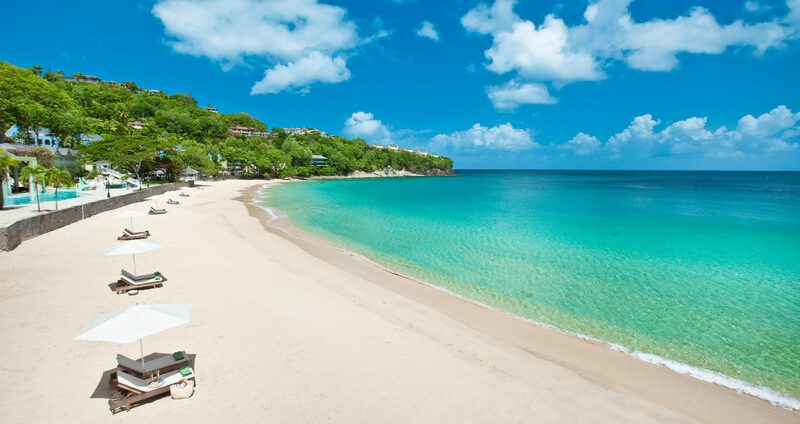 Round-Trip Transfers from Saint Lucia Airport (UVF) to all Sandals Resorts in Saint Lucia are included. Get up to $635 Instant Credit. For inclusive offer, the $635, $525, $405 & $275 Instant Credits are in USD, applied to the base fare and excludes government taxes and fees, which must be paid at time of booking and is fully non-refundable. 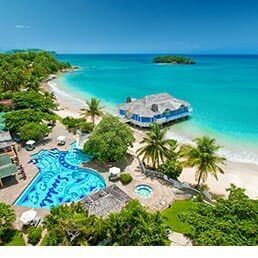 Book a minimum 6-night stay at Sandals Halcyon Beach, Sandals Grande St. Lucian or Sandals Regency La Toc and receive free green fees and transfers at the all-new Sandals St. Lucia Golf & Country Club at Cap Estate. Offer is valid at US/CA. Offer valid for a 6-night minimum stay at Sandals Grande St. Lucian, Sandals Halcyon, and Sandals Regency La Toc. Offer valid for bookings made by Feb. 15, 2019. Caddies are not mandatory, and not included. Rates as follows: $20.00 per caddy for 18 holes, $10.00 per caddy for 9 holes. Promotion is not applicable to contracted groups. Golf clubs are optional and available at an additional cost. Rates are as follows: $20.00 for 9 holes, $30.00 for 18 holes. This promotion may be redeemed on property in the Golf Shop. Guests must use the free green fee offer during same stay.